EMS was introduced in the company in 2001. We hold pure nature in high esteem. We use environment-friendly materials and equipment, we support recycling and prevent the wastage of resources. All negative impacts of our production have been reduced to minimum possible amount on a long-term basis. Observance of environmental safety rules has become a natural part of the work procedures and attitude of all our employees. QMS was introduced in the company in 2001. All major activities have clear-cut rules. You can also rely on our inventiveness and willingness to satisfy your requests. All products undergo three-stage-inspection. In accordance with the customers requirements we are able to carry out product testing or arrange for certified laboratory testing, 3D measurement, 3D modelling etc. Our long term production experience enables us to fulfil the increasingly complex requirements of our customers. The expertise of our employees is guaranteed by a company education system designed to improve their qualification, knowledge and specialism at all levels. Each employee bears his/her own responsibility for the standard of their workmanship. 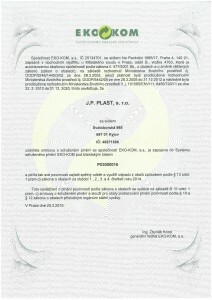 J.P.PLAST, Ltd. Kyjov meets its legal obligation of packaging registration, their record keeping, utilization including recycling through the agreement with AOS EKOKOM. J.P.PLAST Slovakia, Ltd. Prievidza meets its legal obligation of packaging registration, their record keeping, utilization including recycling through the agreement with ENVI–PAK, a.s.
Quality and environment policy expresses the company’s strategic focus, includes a commitment to fulfillment and continuous improvement. 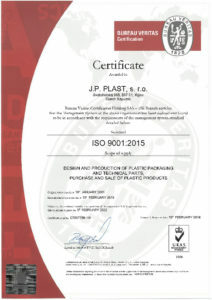 The document updated and approved by the company management is binding for the entire J.P. PLAST group.